"In partnership with Hillshire Farm Brand, we're helping you make dinnertime easy, quick, and delicious. 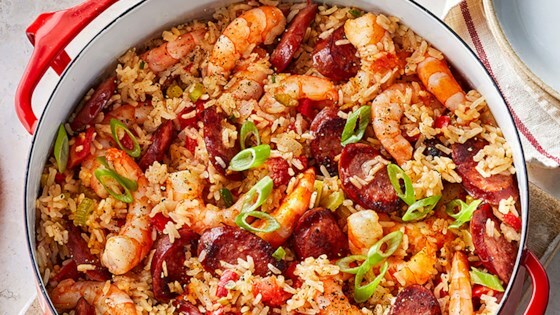 Here, a medley of sweet and spicy flavors comes together in this classic Cajun dish." Heat oil in a large Dutch oven over medium-high. Add sausage; cook about 6 minutes, stirring occasionally, until lightly browned. Add onion, celery, bell pepper, garlic, and jalapeno. Cook 5-6 minutes, stirring frequently, until vegetables are softened. Add rice and cook, stirring constantly, 30 seconds. Add stock, tomatoes, salt, and cayenne pepper. Bring to a boil; cover, reduce heat to medium-low, and simmer until rice is just tender, 10 minutes. Add shrimp, cover, and cook until shrimp turn pink, about 4 minutes. Remove from heat. Stir in scallions and lemon juice. Garnish with additional scallions. I didnt add the jalapenos it was spicy enough with the cayenne pepper. I will definitely be making it again. Loved it, was somewhat bland but hot sauce cured that. Delicious! I added a little more of the sausage- otherwise followed accordingly. It was very tasty! I rate this five stars! Will be making this a lot in the future! I've made it twice now, been great both times.